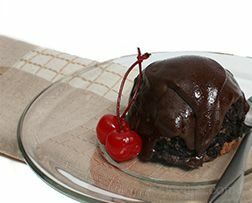 The moist cake is flavored with the classic combination of chocolate and cherries. 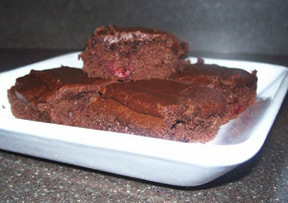 A rich chocolate cherry glaze makes the cake extra special. 1. Preheat oven to 350Â°F. Mix cake mix, pudding mix, eggs, water, oil and 1 tablespoon extract in large bowl with electric mixer on low speed 30 seconds. Beat on medium speed 2 minutes. Stir in chocolate chips. Pour into greased and floured 12-cup Bundt pan. 2. Bake 55 minutes or until toothpick inserted in center comes out clean. Cool in pan 10 minutes. Invert cake onto wire rack. Cool completely. 3. Meanwhile, prepare Glaze by mixing sugar, milk and butter in small saucepan. Stirring constantly, bring to boil on medium heat and boil 1 minute. Remove from heat. Stir in chocolate chips and 1 teaspoon extract until chips are melted. Drizzle glaze over cooled cake.